Like Jupiter, Saturn has a large amount of moons that surround this gas giant. These moons are also grouped together in family groups just as Jupiter's moons are, however, Saturn's moons are also divided into subgroups as well. There is a total of 7 satellites, 46 moons, 3 Trojan moon groups, and 9 provisional moons that have been discovered so far. Mimas — has been nicknamed by some as the "Death Star" due to a large impression on its side causing the small satellite to have the appearance of the famous "Star Wars" icon. It's surface consist primarily of water ice and this appears to be the only element on the satellite that can be found. It is the smallest known body in space to be rounded by its own gravitation. 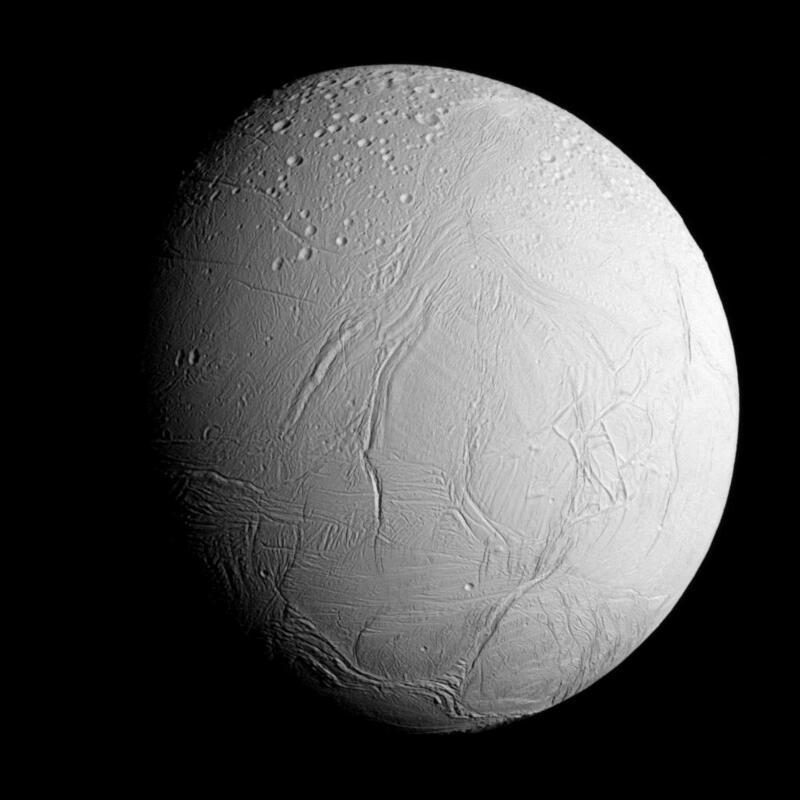 Enceladus — is the second satellite in Saturn's orbit. Beneath its surface is a subsurface ocean that ejects water vapor into the atmosphere. They believe this water vapor is what contributes to Saturn's "E-Ring". Above the surface, the satellite is covered in ice. In 2005 the Composite Infrared Spectrometer (CIRS) observed a heated area in the Southern polar region but after much debate scientist are still baffled as to what is causing it. Tethys — having a similar large crater near it's Western hemisphere to Enceladus only not as pronounced, Tethys is Saturn's third satellite. It's surface is primarily water-ice and a small amount of rock, there appears to be a small amount of dark material as well but it has yet to be identified. Tethys has the lowest density of the "moons" in the solar system. Dione — is the fourth of Saturn's satellites and is roughly the same orbital distance that Earth's moon has but its orbital resolution is at 2.7 days. The largest amount of impact zones are on its trailing side which is unusual as they typically dominate the leading side, so it is believed that a major impact may have "spun" Dione around at one point. This is mere speculation at this time. Rhea — Saturn's fifth satellite, has a density of 1.233 times that of liquid water. This leads to the idea that Rhea may be three quarters ice and one quarter rock, the best comparison for this would be a dirty snowball. Originally it was believed that Rhea had a rocky core but recent information from the Cassini orbiter in 2005 changed this idea. Titan — a golden haze surrounds this interesting satellite given to its nitrogen-rich atmosphere. Titan is the only known non-planet to contain an actual atmosphere and is the only other body in our solar system to contain one aside from Earth. However, Titan's atmosphere is much denser then Earth's. In September of 2013, propene (an element found only on Earth and our moon) was detected by NASA's Cassini spacecraft. Iapetus — (eye-APP-eh-tuss), is the last of Saturn's satellites. It's Yin Yang of a leading hemisphere of a dark albedo (reflectivity) of 0.3 to 0.5 and its trailing hemisphere of a brighter albedo of 0.5 to 0.6. Around the equator of this satellite is a range of mountains making it look like two "helmets" put together. It is believed that Iapetus is, like Rhea, is three quarters ice and one quarter rock. Note: Many of Saturn's moons are located in its 9 rings. These rings were named using the letters of the alphabet as they were discovered, and so they are not in order. Going from the planet out these rings are D, C, B, A, F, G, and E.
Norse Group — the largest group of Saturn's moon groups is the Norse Group consisting of 13 major moons (Phoebe, Greip, Jarnsaxa, Mundilfari, Suttungr, Hati, Thrymr, Aegir, Fenrir, Surtur, Ymir, Loge, and Fornjot), two subgroups Skathi (Skathi, Skoll, Hyrrokkin, Bergelmir, Farbauti, Kari, S/2006 S 3, and S/2006 S 1) and Narvi (Narvi and Bestla), and 6 provisional moons that are not classified under the 2 subgroups (S/2007 S 2, S/2004 S 13, S/2004 S 17, S/2004 S 12, S/2004 S 7, S/2007 S 2, and S/2007 S 3). These moons follow a retrograde (opposite direction of the parent) orbit. Inuit Group — consist of 5 moons (Kiviuq, Ijiraq, Paaliaq, Siarnaq, and Tarqeq) which follow a prograde (same direction as the parent) orbit around Saturn. The inclination is approximately 40 to 50 degrees around Saturn, meaning their elliptical orbit around Saturn is at a 40 to 50-degree angle. Their eccentricities (degree of orbit compared to circular or elliptical, 0 would be circular, 1 and up are elliptical) are at .15 to .48. Gallic Group — consist of 4 moons (Albiorix, Bebhionn, Erriapus, and Tarvos) that follow a prograde orbit around Saturn. They have an inclination of between 35 and 40 degrees and their eccentricities are at approximately .53. Aegaeon — is relatively small, at only 1/3 of a mile wide, and located in Saturn's partial G ring and does not belong to any family group. It is believed that this "moonlet" is the main source of the ring. Aegaeon is Saturn's smallest moon and is elongated in shape. Aegaeon's density is similar to water ice and it has an albedo of .15. Anthe — orbiting between Mimas and Enceladus, Anthe is approximately 1 mile in diameter. There is strong belief that Anthe (along with Methone and Pallene) may actually be parts of either Mimas or Enceladus that had broken off. Another belief is that they all belonged to a larger collection of asteroids that got caught in Saturn's pull. Atlas — at 20 miles in diameter, Atlas has a strange "flying saucer" type shape and it orbits at the outer edge of Saturn's A ring. It's albedo registers at a .4 level which is similar to that of a C- or D-class asteroid and was discovered from photos sent back by Voyager I in 1980. Daphnis — the existence of Daphnis was known by the "waves" that were noticed in Saturn's A ring but it was not fully confirmed until the Cassini probe sent back images in 2005. Approximately 4 miles across, this small moon sculpts the edge of the Keeler Gap making waves in the particles there. Hyperion — the largest of Saturn's irregularly shaped moons, Hyperion is approximately 83 miles (135 km) in size. Roughly the shape of a potato, it is believed to have belonged to another moon at one point and was broken off by a major impact. It has a chaotic orbit unpredictably tumbling around Saturn and is kept this way by the resonance (gravitational influence) of Saturn's Titan. Methone — located between Mimas and Enceladus, Methone is approximately 1 mile (1.6 km) in size and may have been (along with Pallene and Anthe) apart of either Mimas or Enceladus or, all five moons may have been part of a swarm of asteroids that passed through. Methone's orbital path around Saturn takes approximately 24 hours for it to complete. Pallene — is located in orbit between Mimas and Enceladus along with Methone and Anthe. This little moon is in a dynamic relationship with Methone and Anthe, basically, the three moons along with Mimas and Enceladus assist one another in their rotation and movement. The moon is approximately 3 miles (4 km) across and takes about 27 hours to complete its orbit around Saturn. Pan — is approximately 8 miles (14 km) in size and is responsible for the Encke Gap (200-mile gap in Saturn's A-ring). It creates "wakes" in the ring during its orbit around the planet taking about 13 hours to complete. This moon, like Atlas, has a flying saucer-type shape. 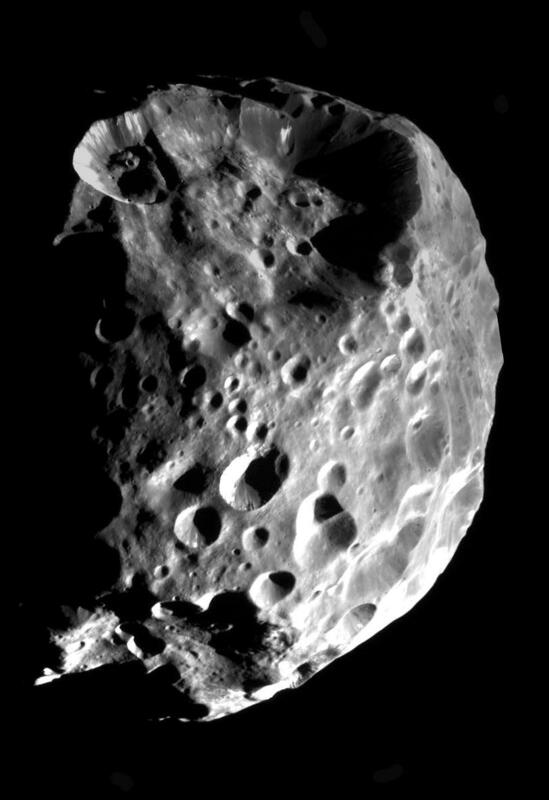 Pandora — shaped like a potato like Hyperion, is approximately 25 miles (40 km) in size. It is covered in a dust-sized icy material all over its surface and is located near Saturn's F-ring. It has an orbital time of approximately 15 hours to complete. Prometheus — occupies the inner part of Saturn's F-ring. Extremely irregular and potato like in its shape it is covered in craters that are up to 12 miles (20 km) in size. It is believed that its surface is porous because of its low density. It Is approximately 26 miles (43 km) in size and has an orbital time of about 14 hours around the planet. A Trojan Moon is a moon that shares an orbit with another, larger moon. They move in a synchronized fashion and never collide with one another. The "Trojan" can either be trailing or leading the larger moon it shares it's orbit with. Calypso, Telesto, & Tethys — Calypso "trails" after Tethys which is lead by Telesto about 60 degrees. These small moons are approximately 14 to 15 miles (23 to 24 km) across in size and are irregularly shaped as most Saturnian moons are. Epimetheus & Janus — is in a co-orbit with Janus and strangely enough switches places. There is approximately 50 km (31 miles) difference between them so there is no danger of collision between the two. Every four years these two moons switch orbits and the inner moon becomes the outer moon and vise versus. Helene, Dione, & Polydeuces — Helene co-orbits with Dione which in turn is trailed by Polydeuces and is located at a Lagrange Point, basically it is a gravitational pull between the planet and a larger moon is balanced keeping smaller moons between them in their orbital placement. All three moons are irregularly shaped take approximately 2 days to complete their orbit around Saturn.